How to restore Pelvis Balance? By taking this time, you’ll be able to prevent problem and be at your best to take care of your baby. – Until the 21st days, put a compression bandage around your pubic symphysis, around your hips and under iliac crest. You can use a scarf or a slink or belt provided at the hospital. Nobody told you that (one more time! ), but it is common to experience articular pain after delivery (wrist, ankle, pelvis, back,….). 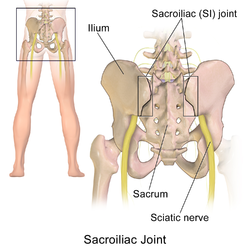 – The most common one is around your sacro-iliac joint (your pelvis) with or without irradiation in your legs as a sciatica. – Thanks to your hormones, you are very flexible and consequently you could have a sciatic nerve pinch with or without irradiation. – Another important pain is localized in the pubic symphysis area (maybe you had a SPD during pregnancy so you already know this pain! ): You can feel a burning pain in between your legs, especially when closing or shearing your legs (walking or rolling over). – The last but not the least is coccyx pain. You can feel it when you sit down or when you stand up. If you gave birth lying on your back with legs up, your sacrum or your coccyx may have moved backward or slightly on the side leading to muscles/articular tension and pain. For this last problem, the best it is to see a therapist (womens health physio or osteo). He/she will manipulate your coccyx/sacrum in its correct position. In the meantime, try to sit forward, wear your pregnancy belt on and, sit on your Swiss ball as often as possible. You’d probably notice a gap in the middle of your tummy. Also your tummy seems very soft and a bit swollen (you can see your gut working after a meal!). It’s call a diastasis! It is very very important to close this gap before to start any lifting or exercises. See Here to know more about it! As you are a new mum I know, you can’t avoid lifting your baby and the prom and….. Still you can protect it! 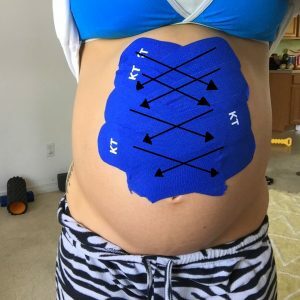 Ask your women’s health physio to put a diastasis k-taping to start closing this gap and to avoid your gut to herniate through this gap. 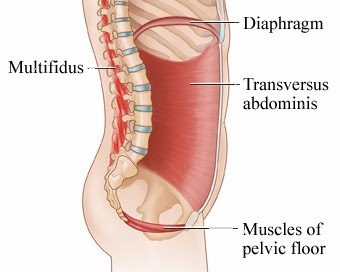 In case where the diastasis didn’t disappear an Abdominal Rehabilitation may be necessary. I know that is not the most glamour part…. But it is very important to heal this damaged part of your body. You might have a tear or an episiotomy and have stitches. But even so, you have to start soon to squeeze gently your pelvic floor. I am not telling you to do your kegel exercices directly at the hospital. But after 48 hours you should squeeze it 3 or 4 times, twice a day (as if you want to stop the urine flow) you will help the blood circulation and the healing process. It is also important to avoid swelling and to retrain your muscle. Start by squeezing your pelvic floor correctly, to do so relax when you breathe in and squeeze when you breathe out. Try to do it in different positions without gravity or abdominal pressure (lying on your back or on your side, sitting in a comfortable position. You can do it when you are breastfeeding if you feel comfortable). For more details have a look at our previous article about pelvic floor exercise. Never try to stop urinary flow when you urinate (stop pee is reason of cystitis!!!). In some cases, due to an important weakness or other issue (episiotomy, incontinence or prolapse…), a pelvic floor rehabilitation may be necessary to recover a correct control and strength. For more information, have a read at our previous article about pelvic floor rehabilitation. If you did pregnancy perineum massage, it is going to be an easy one! Put some cream or lubricant or almond/perineum oil and make half circle. Your physio can also help you at this stage with lymphatic massage or electro stimulation to promote healing of your scar. After 6 weeks, you shouldn’t feel your scar anymore. A non-contractile fibrous scar block nerve endings and cause a loss of sensation and mobility. In the first weeks (up to 3 months), avoid impact sport (running, jumping,…). Classic abdominal exercises are completely forbidden in the first months (otherwise you will worsen your diastasis). For more details about what sport to do or do avoid have a look at our videos or our previous article on the topic. For specific exercises to do after giving birth have a look at pelvic floor exercises and at abdominal exercises! We hope you find it interesting! Don’t hesitate to give us feedback if you tried some of our tips or if you would like to share one of yours with us!